The government has approved funding for a National Film Centre on London's South Bank, as well as extensions to the Tate Modern and British Museum. 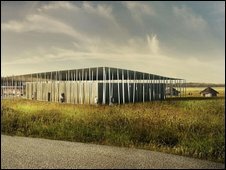 Funding will also be found for a new visitor centre at Stonehenge and a new home for the British Library's newspaper archive in Yorkshire. Prime Minister Gordon Brown said the funding highlighted the government's "continuing support for the arts". It follows concerns that high-profile projects would be hit by budget cuts. Earlier in the summer, it emerged that the Department for Culture, Media and Sport had a massive shortfall in its budget over the next two years. Shadow culture secretary Jeremy Hunt responded to the new plans, saying: "Unless Gordon Brown can explain where this money comes from, this looks like nothing more than a hollow PR stunt." The government said it would provide £45m to help fund the National Film Centre, a long-cherished project of the late film director and former BFI chairman Anthony Minghella. The centre will provide a new home for the British Film Institute and become a venue for key film events, such as the opening night of the London Film Festival and global premieres. It is expected to house five digital cinemas and is destined for completion in 2015. Further investment will come from the London Mayor's office, which has promised £5m, the sale of the BFI's current London offices and outside investors. "Britain has achieved worldwide respect for its innovative and vibrant film industry," said the prime minister. "The commitment to the new BFI National Film Centre demonstrates the government's continuing support for the arts in Britain, and our determination to invest in leading creative industries as part of our economic recovery." The investment comes on top of £25m that the government has already committed to preserve for the nation the BFI's internationally-acclaimed film collection. A spokesman for the BFI said: "We're absolutely delighted that we can start to move forward and realise our long-term strategy. "Film is up there with other art forms such as dance and opera and the visual arts. It is high time that film got a centre worthy of the form." 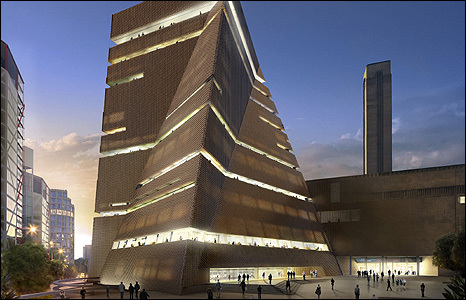 The government will also donate £50m to the Transforming Tate Modern project. The proposed £215m extension - an 11-storey brick and glass structure - will increase capacity at the museum "responding to the needs of visitors in the 21st Century". "We are enormously grateful to the prime minister and to the secretary of state for culture for their support of this project at a time of financial constraint," said a statement, released by the Tate. A sum of £74m had already been raised towards the extension in public donations - a third of the overall cost. 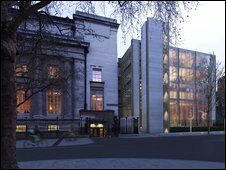 Funding of £22.5m has also been granted towards the £125m British Museum extension, which is still awaiting planning permission. "The new World Conservation and Exhibitions Centre will ensure that the Museum can continue to be a world leader and vital international resource," said a statement from the museum. Culture Secretary Ben Bradshaw announced that £10m would be donated to Stonehenge, citing the "below par" visitor facilities. "The investment announced today means that our most iconic World Heritage Site will finally be able to welcome visitors in a way that is fitting to its international importance." It is hoped the work will be completed in time for 2012 and the influx of visitors expected for the London Olympics. "Britain's arts and cultural life are the envy of the world and make a huge contribution to the quality and fabric of our individual and national lives," said Mr Bradshaw. "But they also have a vital economic role - in encouraging overseas and domestic tourism, creating jobs, and nurturing and supporting our creative industries."